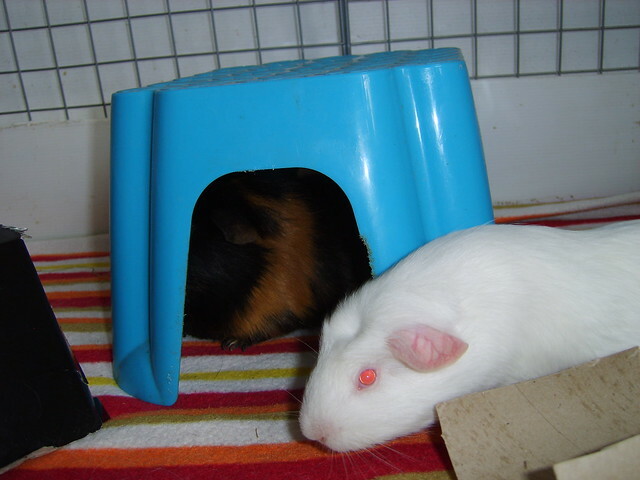 Anselmo (the oldest one) was starting off with his bladder problems around that time, so we thought we'd wait a little while, leave him on his own, and keep Toki and Jon (the newbie) together. We have a feeling that's one of the reasons why Jon was attacking Anselmo, he could sense the illness in him. It wasn't long after Jon Snow arrived that we had something very unexpected occur. I'd spent so long pretty much writing off Anselmo with his bladder stone problems, and trying to make sure that Toki wouldn't end up alone when Anselmo's time came that what happened next came completely out of nowhere, and still today I still see it as a complete shock. 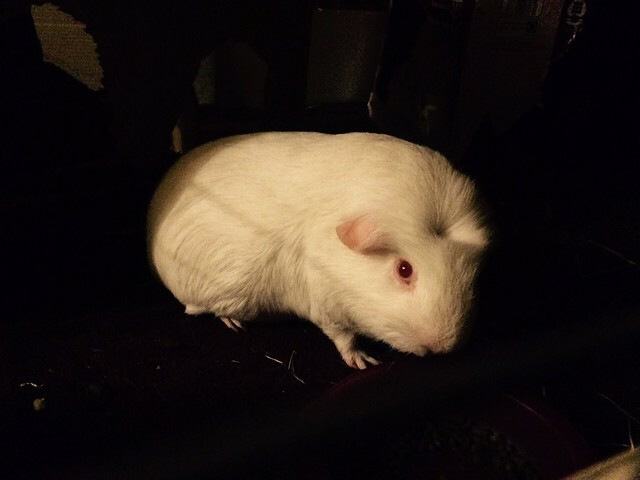 25th September 2013 Toki passed away. He was 2 years old. The string of events that happened was really unfortunate and unlucky and despite having help from friends we weren't able to turn him around. It starts a few days earlier when he was struggling to eat. Just out of nowhere, one minute devouring food, the next not being able to. 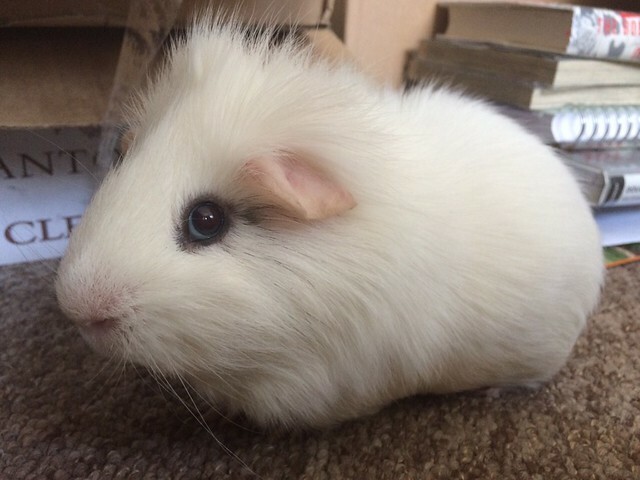 Toki was the piggy that made my boyfriend fall in love with pigs. He loved to see his silly wide eyed face, and his always orange chin. 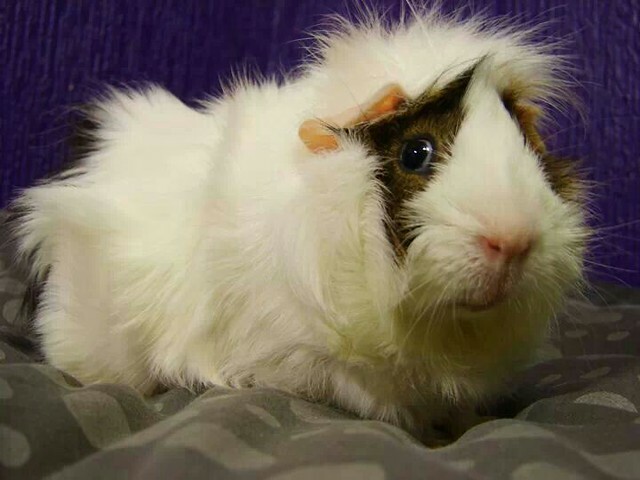 I know we all say how unique a piggy is but I've never seen another pig that looked anything like Toki. He was like a small fluffly cloud. We'll always remember the simple guy. Our fondest memories are of him standing up at the wrong side of the cage for his veg, and him running away squealing after he decided to take on Anselmo once for 'Top Pig' spot. So, now we were back to 2 pigs, Anselmo and Jon Snow. 2 pigs who don't really like each other. Lots of good luck vibes were needed for this pairing! He was such a handsome guy, Jaycey. And a character. No wonder your boyfriend fell in love with him. Oh my gosh! What a cutie! I'm so sorry you lost him at such a young age. I remember Toki and was a cutie pie he was. Very sad that he wasn't around for long, but glad he was in your care for his short time here. It makes me happy that Toki is remembered. I know I've been around Guinea Lynx for years now, but I never post that often, so I guess most people don't really know of me. 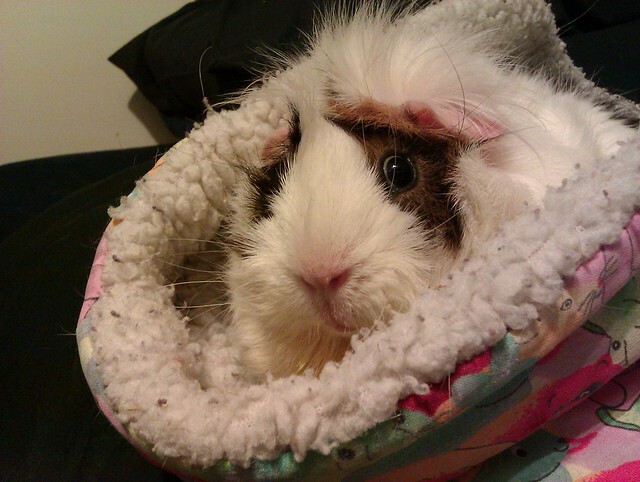 He was a really great piggy. There were many 'what if's' thrown around when he died and still to this day. I do really wish I had known about the dental sanctuary back them. But, I did everything I possibly could for him. And we definitely did love him. He had a bad start to life, he was dumped in a park on a dreadfully snowy day, along with his 13 (or so) siblings. They were in a cardboard box with only each other and a small plastic igloo for warmth. Thankfully someone found them and took them to the RSPCA. 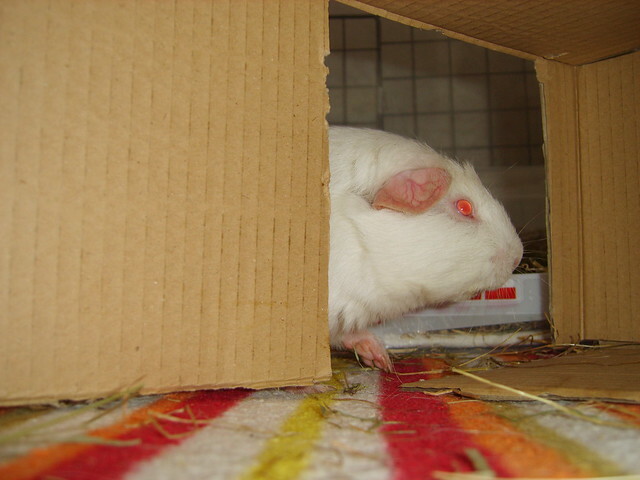 Unfortunately his siblings didn't like him and he was picked on, and so the lovely RSPCA girl took him home with her. And he eventually came to live with me. We have a commissioned drawing of him hanging on our wall at home. I'll take a photo of it, and post it here. It's really amazing! It's based on the photo above, with the purple wallpaper in the background. Toki really tugs at my heartstrings. I just started your story and had to come back and read more. 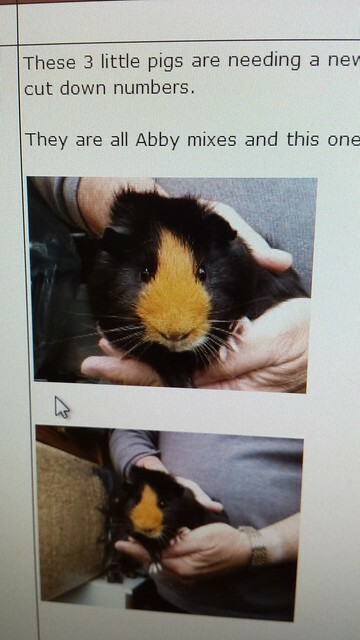 It's interesting how all of our lifes are so different, except of course that common golden thread called guinea pigs. Here's our memento of little silly Toki Wartooth. Isn't it fantastic? I felt a bit cruel as the artist had only done piggy faces before, and also hadn't draw a white pig but she loved the challenge. I really love it. I'm going to skip ahead a bit on my story, to around May 2014. Mainly because there wasn't much of interest happening in Pigville, and I want to introduce the next chracter. Anselmo had a further bladder stone surgery so I had to keep him separated to heal. I think that, and his illness made Jon into a wild pig and they ended up fighting repeatedly. Anselmo ended up with a bite through the end of his nose, and I thought that was that. I'll leave it here with that adorable face whilst I go and find more photos of him to upload. Yes, lovely drawing and really does capture his 'who me' look so well. A wonderful keepsake of your special boar. Aww. 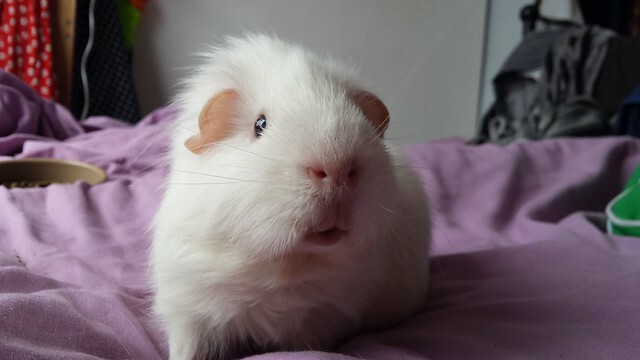 Toki's face reminds me of my piggy that recently passed away, Willow. 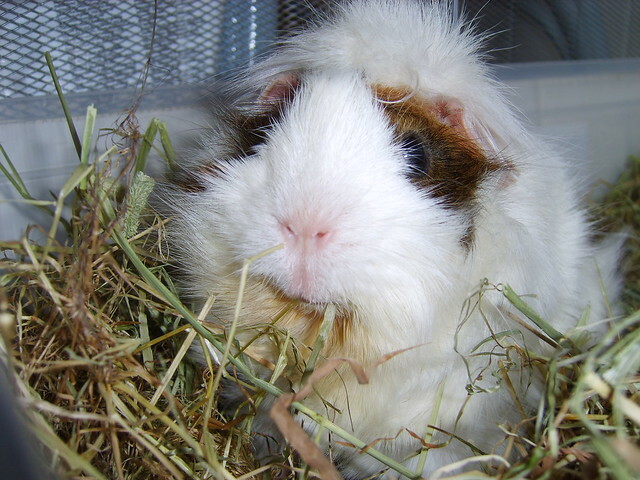 I like it when you can see a bit of the white of a cavy's eyes. It gives them an amusing expression. That's what we love too CyborgCavy. One of the pigs, Anselmo, has pea eye now so you can always see the under part of his eye. He's looks funny sometimes head on. It was a lovely lady called Carrie-Anne, and her website is www.cardarte.com. I contacted her through Facebook after she drew some cards for the NEGPR group. She has a page on FB too called Penguin Pebble, which has the Toki picture on there as an example of what she does. She's based in Durham but posts the pictures to you. Toki cost £35 for the drawing and there are various options for the frame. You can get it unframed, but I went for a bit more expensive option as I wanted it as a present for my bf. The frame was £15. So, all in it cost £50. Definitely worth it as she was in constant contact showing me the progress and asking if I wanted any changes. I'd happily ask her to do another of our piggies. Oh, Toki was the first full pig she had drawn. She normally just does faces, so that's an option in you wanted a few of your ladies in one picture. 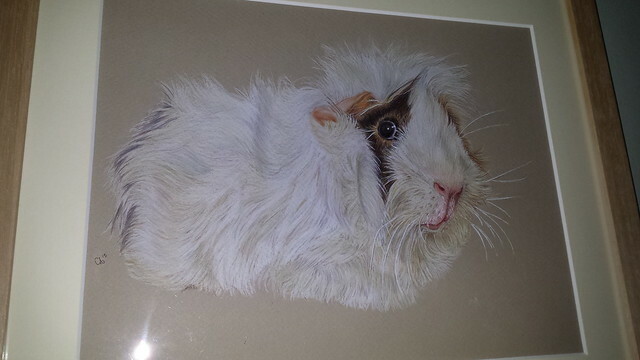 I am guessing the more guinea pigs in the picture, the more she might ask to draw it. She is a fabulous artist though!! I've decided that I'm never going to catch up with this chronicle, but I also don't want to not share my beasties with you all, so I'm just going to skip forward to the present. But, not before briefly mentioning this little guy. Isn't he the cutest?!! Spencer wasn't with us for very long, but that doesn't mean he wasn't part of the family and we didn't love him, and be always entertained by him. We fostered him after a friend had to rehome him. He was a lone boy who needed company. We had Anselmo who was a lone boy, but a bit fussy with company. So, we gave it a whirl and they clicked brilliantly, they loved each other. Unfortunately during a routine vet check up we discovered a massive growth inside him, and during an exploratory, possibly removal surgery we had no choice but to let him go. The growth was far too complex and too advanced. We miss him lots, but we are thankful for the few months of fun (and exercise) he gave to Anselmo. Yes, another of your lovely boars that I remember from your older threads. I'm glad he got to spend his last days with a friend and in your wonderful care. He was a funny little boy GP_mum. 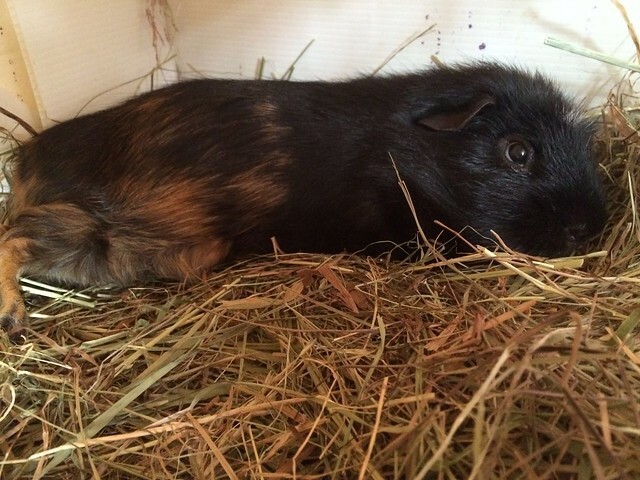 One of the few pigs that I've had that you could sort of class as a lap pig. He wasn't cuddly but he was more than happy to use you as a pillow. Firstly, we have Anselmo. He likes this comfort as you can possibly tell from the photo taken of his this past weekend. He's around 6 ish, I adopted him in June 2010 and he weighed 1kg so I'm guessing he was around 8-12 months old when I got him. He's a tough old boot, that has had 2 bladder stone surgeries and so has a limited diet these days, which doesn't stop him weighing the most out of my current 3 (He loves his hay). He also has an allergy (possibly) problem so has a nebuliser, which he hates so I have to do it when he's having his veg to distract him from chewing the box. He has managed to chew through the tube though! He's very grumpy and doesn't like my other two boys and so lives alone. He'll let you pet him for a few minutes then he decides to give you a warning nip. He bites the vet too, but she still thinks he's a handsome boar. He's a master at getting into places he shouldn't be, and I've found him inside a zipped up bag, in Jon's cage, and also wrapped up in a towel next to a frozen water bottle. We didn't think he's still be with us and sort of expected Xmas 2014 to be his last because of his repeated stone surgeries, but he's still here! Secondly we have Jon Snow. 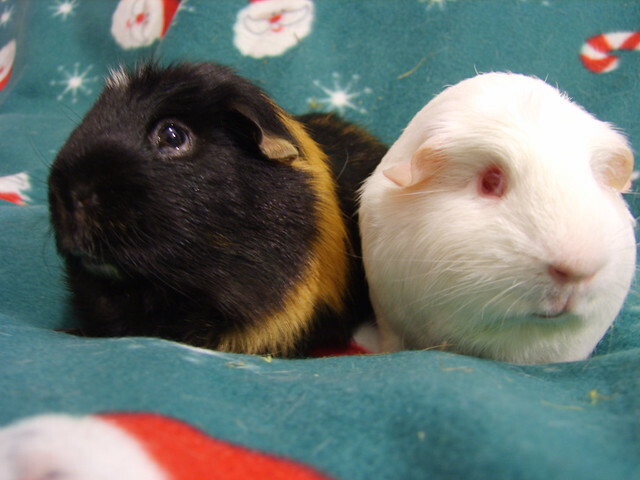 Adopted from BamBam and Hilary Holmes, when they were fostering some piggies. He has a brother called Marshall, who wle312 has. He'll be 3 on June 15, he shares a birthday with my Dad! 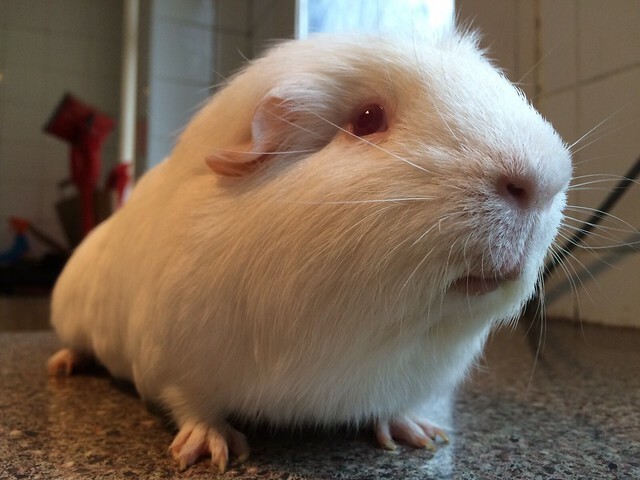 He's a funny little chap, loves to popcorn and jump around (ending up on his side sometimes). He's not a cuddler and will desperately try to get off your lap as soon as possible. Only this weekend he's learnt a new trick, climbing up the bathroom step, my boyfriend is very impressed. He was originally part of a trio with Anselmo and another piggy Toki, but after Toki died the duo didn't work out. I adopted Podrick (who's up next) and it worked for a while. Until Jon's rumblestrut activated at about 2 years old. He lives on his own in a 2 x7 so he has lots of jumping room.